It's been called the greatest science fiction novel of all time. Maybe, maybe not, but it's one of the best I've ever read. 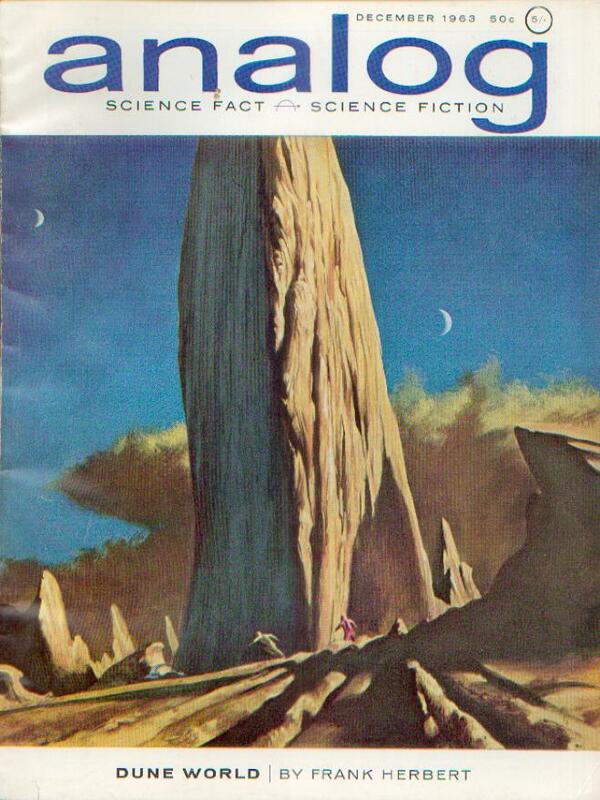 Published all the way back in 1965, it's the best selling science fiction novel of all time. 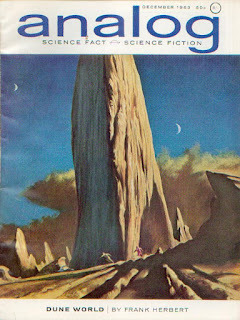 The first half of Dune appeared as "Dune World" in the December 1963 Analog. 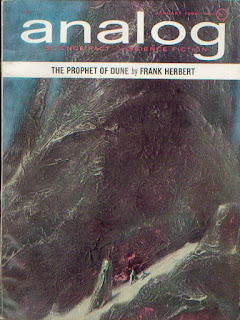 The second half, "The Prophet of Dune" made its debut in the January 1965 issue. I think I read it for the first time in 1980 at the age of 14. From the very first pages I was hooked. 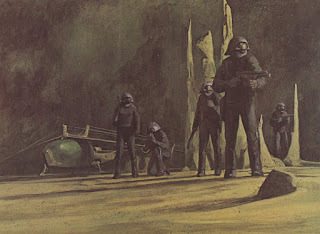 Like Paul Atreides, I was wondering, what the heck is a gom jabbar? What were the Bene Gesserit? What was melange? I was housesitting for my grandfather, which meant the only thing I had to do was let the dog out and feed her and myself. And that meant I barely put the book down for hours. My dad's paperback, at 544 pages, was one of the longest books I ever read in a single day (to date the only longer one I've read is Terry Brook's The Sword of Shannara). I'm not sure what triggered it, but something called out from the depths telling me it was time to reread Dune. The last time I read it was nearly 20 years ago. A friend wanted to get into science fiction, so a few of us started rereading the classics and tossing them his way. Among the books I revisited were Asimov's Foundation Trilogy and The Gods Themselves, Clarke's Rendezvous With Rama, Heinlein's Orphans of the Sky, and Herbert's Dune. Of all those, Dune's the only one I would recommend without hesitation. Foundation is terribly rusted with age, flat prose, and limited characterization. The latter two problems apply to Gods and Rama as well. Orphans is good and pulpy, but ultimately nothing special. Dune on the other hand is a book that remains exciting and feels fresh fifty years after its debut and, for me, after numerous readings. I'm about well into Dune and the overthrow of House Atreides has just taken place. In the lead up to that, numerous plots have been set in motion: create a genetic messiah, win the Fremen as allies, thwart the Emperor's plans, and of course, destroy the House of Atreides. Two things have struck me so far. The first is how much of the book I actually remember. From lines like "Tell me about the waters of your homeworld," to whole scenes, like the revelation of Baron Harkonnen's plans, the book feels far more familiar to me than I expected it to. While I have read it three or four times before, that was a long time ago, and I'm really surprised. The second thing, is how obvious the narrative gears are. This is the first time I'm coming at Dune with a critic's eye. Every one of the chapters I've read is an info dump. The Reverend Mother Gaius Helen Mohiam, during her interview with Paul, manages to give some of the history of the Bene Gesserit sisterhood. 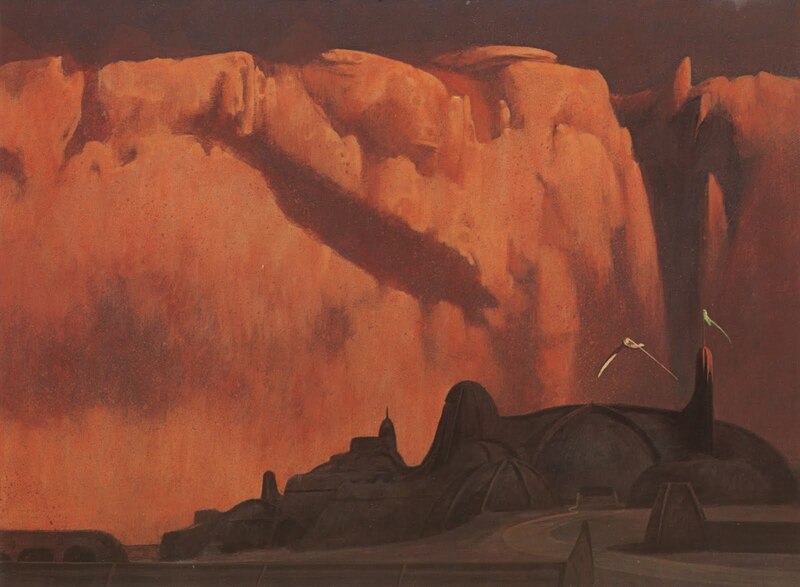 Thufir Hawat, and Gurney Halleck both tell us about the plots within plots ensnaring the Atreides as well as an understanding of the political and economic systems of the Dune universe. Dune is a complex and complicated book and Herbert tries to give you all the tools to understand things once the plot really gets moving. So he throws a load of information at you right away.The trick he pulls off so well is how he weaves it into the expanding story. Between each paragraph of plot and characterization there're one or two of exposition. While the Reverend Mother tests for Paul's humanity with the pain box, she also talks about the Butlerian Jihad and the Kwisatz Haderach. Baron Harkonnen's chapter introduces the spice trade and the emperor's killer elite, the Sardaukar, and at the same time clues us into how the Atreides will be betrayed and destroyed. Each of the early chapters does the same thing, and it stands to Herbert's talent that it feels natural even when it's so obvious. 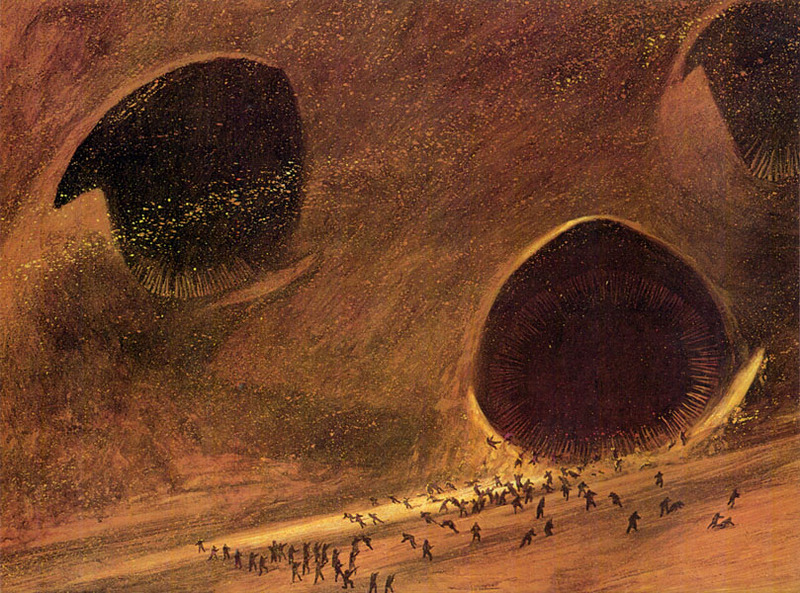 I am absolutely loving Dune at this point. There's thrilling intrigue and lots of space empire stuff. As much as the ecological and cultural aspects the novel has, is it resolutely a space opera with all the trappings. The guild Heighliners are as titanic as starcraft in the Lensmen series, the sand worms are straight out of the pulpiest space opera, and the characters and plots are more costume drama than pure sci-fi. He even figured a way to have his fights with swords and knives that makes some logical, sci-fi sense. The deeper elements, the eco business, colonial exploitation, and systems of belief, are well done, and never at the expense of the story. Herbert clearly had points he wanted to make about those subjects, but he knew how to keep them from making the story a slog (supposedly, something he failed at in the later books). 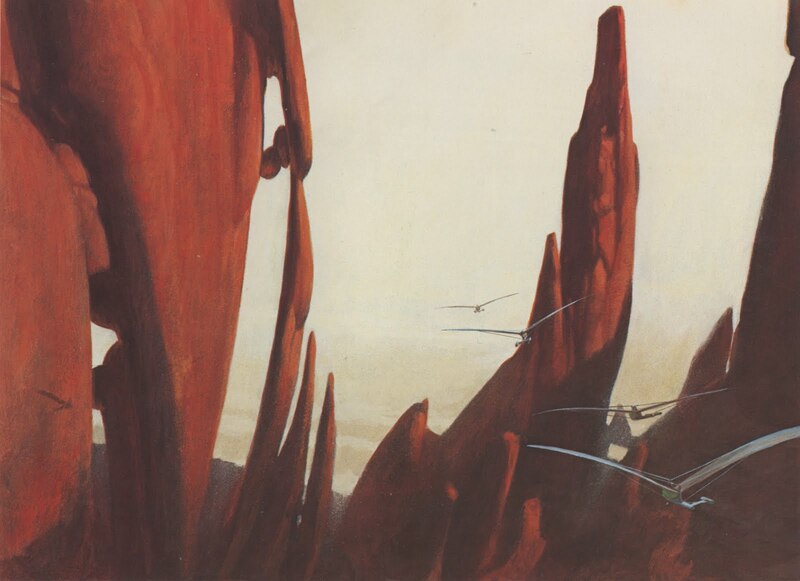 Arrakis, even at this early point in my reading, before Paul and Jessica are out in the wilderness, rumbles with life. With descriptions of the planet's titanic storms, birds that thrive on blood, and the mysterious sand worms and the spice, in this sand planet, Herbert created one of the greatest sci-fi archetypes (ripped off by George Lucas for Tatooine). With constantly shifting viewpoints and interior monologues, Herbert cracks open the characters' heads for the reader. 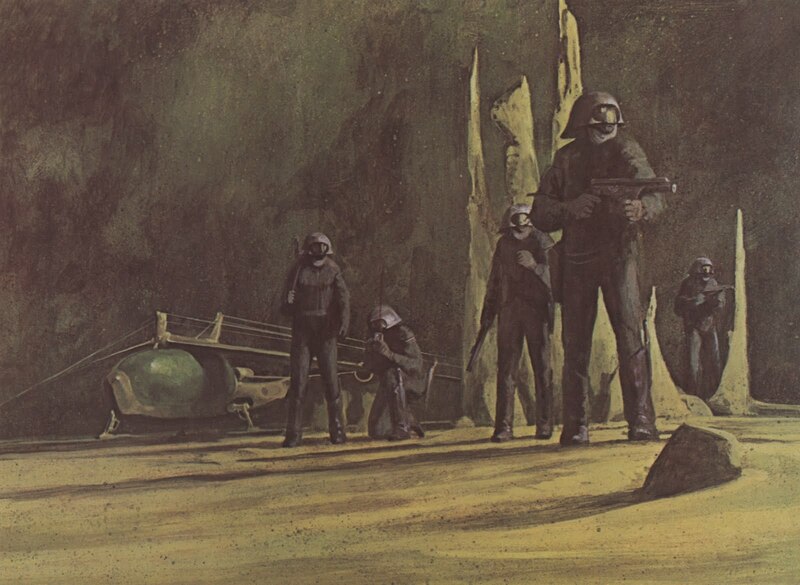 From major characters Paul and Baron Harkonnen to the Shadout Mapes, the Fremen housekeeper, while still bound to the plot and genre, come to life. I'm can't remember any book so replete with interior dialogue. Nearly every named character gets to reflect on what's happening. It's an interesting approach, that like everything else, I'm loving. I've been a little slow reading Dune, for which I'm grateful. Instead of barreling through it, taking my time lets me catch all the little bits and pieces I might have missed otherwise. Packed between all those parts I remember are conversations and descriptions that are proving incredibly important bringing things to life. Some of them, and Jessica and Paul contemplating everyone's actions during the dinner party leaps to the mind, are far more important than many of the bigger events in illuminating Herbert's world. I won't say more. As much of the plot I've described so far, I haven't really given away anything that isn't in the first ten pages and I' rather not spoil it. If you haven't read Dune, you should. Fifty years old, it steel feels up-to-date and big.